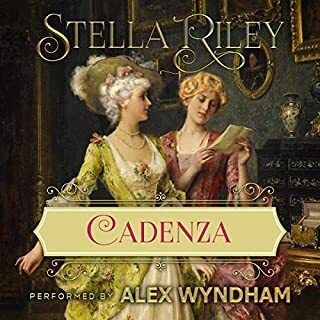 It is said that you should always leave the best until last and in Cadenza- Rockliffe book 6; Stella Riley and Alex Wyndham have certainly done this as the final curtains closes on this most exquisite series. Once again the collaboration of writer and narrator has produced another stunning performance that will live with me for a long time. The story starts in Vienna where Julian Langham has just presented his first virtuoso performance and is on the brink of a dazzling career when lawyers lure him into making a catastrophic mistake and now, instead of the concert platform, he has a title he doesn’t want, an estate verging on bankruptcy and thus begins his Cadenza. What follows are two parallel love stories that are very different. One is warm, sensitive and heartfelt while the other is tentative and reticent with both parties treading very carefully in order to be sure of each other’s feelings. I’ll not give the names of the couples and who ends up with who because that would be a spoiler but suffice to say the writing and performance by Alex Wyndham throughout is measured, moving and completely believable. What I can also say is that once again Ms Riley’s dialogue and characterisation are truly exceptional. The main lead Julian Langham is an absolute delight and Mr Wyndham squeezes every ounce of emotion out of him with the result that he made me smile and also shed a tear. I defy anyone to listen to this audio and not fall in love with Julian. He is truly wonderful and one of Ms Riley’s best male leads that Mr Wyndham performs so well. In fact Alex Wyndham is one of the finest Audio narrators around whose wonderful narrative voice is supplemented by superb transitions from male to female, young to old, gentry to common man that are seamless. In addition to Julian, Arabella – Belle – and Elizabeth – Lizzie – also grace the stage along with Ralph Sherbourne - previously featured in Hazard - where he was truly obnoxious. This is another tour de force from the pen of Ms Riley. Add to this the usual Rockliffe entourage led by the charismatic and formidable Duke, detailed knowledge of the Harpsichord, a well written plot and you have the perfect blend. However, just when you think the ensemble is complete and the performance ready to begin, in walks Max Brandon, Belle’s brother, who steps centre stage. Wow, how good is he. I think he’s the brother all girls would want because he is witty, smart, supportive, intelligent and practical. I can only hope that Ms Riley has a future planned for him because I would like to see more of this relative of Gabriel Brandon from her excellent R&C series, Garland of Straw. 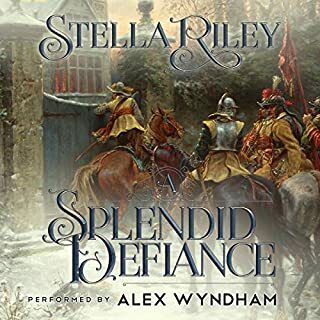 I truly think this is probably the best audio in Stella Riley’s Rockliffe series as it has everything a Georgian Romance should. Consequently when all the participants take their final bow all I wanted to do was shout ‘Bravissimo and Encore’ for Stella Riley and Alex Wyndham who have given another stunning performance. Hazard: A game of Chance and Luck, made riskier when Fate is rolling the dice. For Aristide Delacroix, the first throw summons shades from his past. A man he had met, just once, over a card-table... and the lovely girl indirectly responsible for plunging his life into catastrophe. For Lord Nicholas Wynstanton, tired of waiting for Madeleine Delacroix to make up her mind, it slyly suggests he begin a whole new game with loaded dice; while for Madeleine, it devises a terrifying lesson in missed opportunities and the uncertainty of second chances. HAZARD – A winning pair. 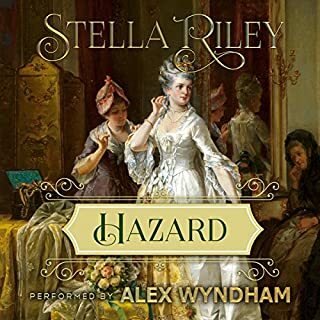 Stella Riley and Alex Wyndham are once again a winning pair in Hazard, the 5th book in Ms Riley’s thoroughly entertaining Rockliffe series. The characters created by Ms Riley are always well formed, articulate and credible. Her expertise in writing interaction between them is so realistic that you believe you are eavesdropping into conversations. So when the amazingly talented Alex Wyndham speaks the lines so beautifully crafted by Ms Riley, you are transferred into what is best described as a radio play with all roles performed by just one person, Mr.Wyndham. Old men, young women, children, aristocrats make no difference to this narrator. He is amazing. In Hazard, humour and poignancy are in evidence throughout. From Edward, Aristide’s new assistant who hums constantly while working and Patrick, the cheery and constantly talking footman to Genevieve who opens up her heart to Rockliffe’s baby daughter in a private moment by describing how only princesses in stories have happy endings. I will not go into the story as some reviewers do but will say that I love Aristide Delacroix and the way every word written and spoken is balanced and exquisitely delivered. The romance between he and Genevieve is delicate, delightful and so romantic. Then there’s Lord Nicholas Wynstanton, brother to the Duke of Rockliffe, whose on/off relationship with Aristides sister Madeleine has been brewing since book 3 – The Player. Will she or won’t she accept his hand in marriage? The outcome is fraught and somewhat uncertain but worthy to the end. Amongst these two relationships is Braxton, a man set on revenge and Ralph Sherbourne, a new character from Ms Riley who warrants further investigation. He sounds very interesting. But the real triumph of this book is the family of friends that we’ve grown to love since Ms Riley’s Rockliffe book 1 – The Parfit Knight, once again brought together with so much warmth, love and support for each other. Well done Stella Riley and Alex Wyndham. Together you are winning pair. Sebastian Audley has spent years setting every city in Europe by the ears and keeping the scandal-sheets in profit. Word that he is finally returning to London becomes the hottest topic of the Season and casts numerous young ladies - many of whom have never seen him - into a fever of anticipation. Cassandra Delahaye is not one of them. In her opinion, love affairs and duels, coupled with a reputation for never refusing even the most death-defying wager, suggest that Mr. Audley is short of a brain cell or two. 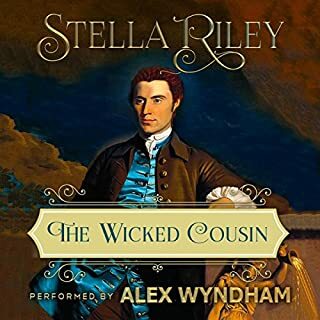 It’s no secret that I have been a fan of Stella Riley’s work for many years and was delighted last year when she finally went into audio by having her Rockliffe series narrated by the amazingly talented Alex Wyndham. I was even more delighted when I discovered that one of her best novels, ‘A Splendid Defiance’, would also be transformed by Mr Wyndham. I have said before that Stella Riley and Alex Wyndham are a true ‘tour de force’ and this book confirms my belief. Ms Riley’s ability to write dialogue and to make her people live off the page is well known. Add this to narration by the brilliant Alex Wyndham whose characterisations are phenomenal and the result is an outstanding audio. Mr Wyndham’s transitions are flawless. Whenever there are a number of people having a conversation, he changes seamlessly from one to another leaving the listener in no doubt as to who is speaking. His performance is the perfect partner to Ms Riley’s words. The siege of Banbury Castle in the English Civil War is little known but what happened there was reflected elsewhere throughout the land during those unhappy times. Once again, Stella Riley handles the storyline adroitly, bringing a mix of real people into the picture along with her own creations. I first read this book many years ago and return to it often because it is unique. Now it’s in audio, I will be able to submerge myself in a world where excellent writing comes together with superb narration. I can’t recommend this audio highly enough. It is absolutely ‘Splendid’. Well done the Riley-Wyndham Team. I look forward to your next collaboration. Tragedy drove him into unwilling exile. Death demands his reluctant return. In the decade between, he has answered to many names and amassed a variety of secrets. Now the actor known to Paris as L'Inconnu must resume his real identity and become Francis Adrian Sinclair Devereux, Earl of Sarre...a man he no longer knows how to be and whose name, thanks to the malice of a friend turned enemy, remains tarnished by an old scandal. Revenge, so long avoided, slithers temptingly from the shadows. Another absolute winner from the Riley/Wyndham team. Yes, without hesitation because it is beautifully written and brilliantly narrated. What was one of the most memorable moments of The Player? What does Alex Wyndham bring to the story that you wouldn’t experience if you had only read the book? A expertise in being able to transition seamlessly from one character to another and then back into the narrative. All his characters are well crafted. Yes - Mr Bailes - see review. Sublime is the one word I can use to describe the final audio in Stella Riley’s Rockliffe series, The Player. Once again the collaboration between Ms Riley and Alex Wyndham has proved to be a triumph because of the written and narrated content. The hero in The Player is Francis Adrian Sinclair Devereux, Earl of Sarre who has spent the last 10 years living in France only returning to England now due to a family bereavement. While living in France he has learned new interesting skills (I won’t say more!) and acquired a good friend Bertrand who adds a lot of fun to the story. As a result French and English characters are sprinkled throughout the book so Mr Wyndham has to narrate the different languages that he does seamlessly - Wonderful. The storyline is typically Stella Riley with assured and well-constructed dialogue between all characters where not one word is wasted - Superb. There are a number of touching scenes in the book but my favourite is when Adrian meets a former employee of his father, Mr Bailes. This is beautifully written and with a real emotional pull. I will not say anymore regarding the plot but will concluded by highly recommending this book to anyone who likes a really good romance coupled with an outstanding narration, which I can only describe as Sublime. The Duke of Rockliffe is 36 years old, head of his house, and responsible for his young sister, Nell. He is, therefore, under some pressure to choose a suitable bride. Whilst accompanying Nell to what he speedily comes to regard as the house-party from hell, he meets Adeline Kendrick - acid-tongued, no more than passably good-looking yet somehow alluring. Worse still, her relatives are quite deplorable - from a spoiled, ill-natured cousin to a sadistic, manipulative uncle. The second book in Stella Riley’s Rockliffe series narrated by Alex Wyndham is a true ‘Tour de Force’. Once again Ms Riley’s characterisation is superb and the story flows along like a gentle stream with Rockliffe – brilliantly narrated by Alex Wyndham – looking for a wife but just sauntering through life with his usual languid air. Suddenly he meets Adeline Kendrick, described as no raving beauty but very sharp and fascinating, which is something Rockliffe finds frustratingly attractive. The story then unfolds as Rockliffe falls desperately in love with Adeline and she with him. But as usual there are challenges along the way and problems to be encountered. And it is here where Stella Riley and Alex Wyndham score emphatically. The writing throughout is extremely stylish, the dialogue is natural, often witty and the characters are so well-drawn and so supremely narrated by Alex Wyndham that you feel you know them personally. The book is well paced, the love story stunningly handled and when we come to the denouement and Rockcliffe’s true feelings are shown in the last chapter, we finally see him completely unravel. Everything he’s felt and thought for months comes pouring out in a torrent of emotion – and, if I have a favourite bit, it was this - handled with absolute perfection by Mr. Wyndham. A true ‘Tour de Force’. I believe Ms Riley’s third audible book in the Rockliffe series ‘The Player’ is coming soon and I for one just can’t wait for it to be released. Wonderful combination of writing and narration. What did you like most about The Parfit Knight? The witty and sparkling dialogue between true-to-life characters. What other book might you compare The Parfit Knight to, and why? The moment when Amberley realised he had fallen in love with Rosalind. 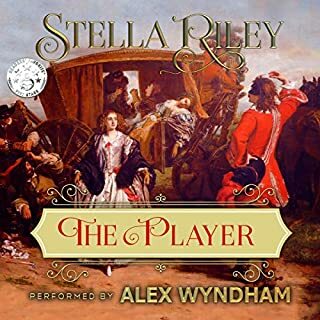 Being a new Audible member, I was unsure whether or not I could adapt to one of my favourite authors, Stella Riley, having her work converted into an audio book. I need not have feared. 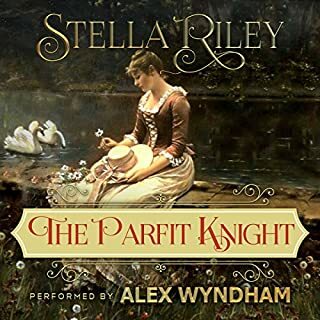 This excellent novel is superbly narrated by Alex Wyndham.Stella Riley’s characters are brought alive by Alex Wyndham in a way that truly surprised and pleased me. Ms Riley’s strength has always been her dialogue, which is consistent through all her novels be it the Rockliffe Series or her English Civil War books. However, when this strength is joined by Alex Wyndham’s narration her character’s come alive in the most wonderful and exhilarating way. Although blind, Rosalind is a delight with no trace of self-pity, while Amberley is perfect for her by understanding the importance of never putting her handicap first. As for the Duke of Rockliffe … well Mr Wyndham’s interpretation is outstanding. Finally the combination of Stella Riley and Alex Wyndham is an impeccable blend resulting in a first class production. Oh and one last thing Broody, the Parrot – ‘Bugger it, Bugger it, Bugger it’ this was really funny. 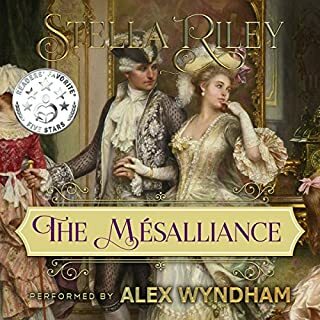 I believe her second book in this series, The Mesalliance, will soon be released again with Alex Wyndham narrating. I for one can’t wait.